What Capacity Washer Do I Need for a King-Size Comforter? Modern front-loading washers take the hassle out of washing a king-size comforter. Before the newer models with upward of 3.7 cubic feet area were available, you had to take a king-size comforter to the local laundromat to wash it. To wash your comforter, you need a machine capable of fitting between 11 and 14 pounds of bedding inside easily. Door open of large capacity front loading washer. 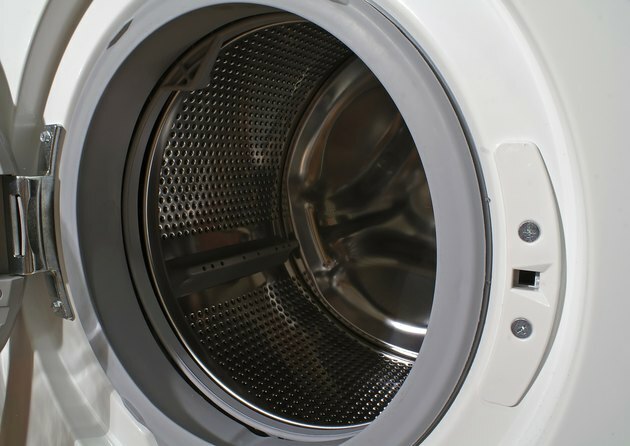 The general rule of thumb is that a front-loading washer with a tub that holds at least 3.7 cubic feet or greater can safely handle washing a king-size comforter. Do not put anything else in the washer when you wash the comforter, or it stands a chance of not coming clean. Some high-efficiency top-loading machines also come in large capacity models. Hang your comforter on a clothesline outside, if you have one, and lightly fluff the comforter in the dryer for about seven to 10 minutes to soften it. You'll need a dryer with at least a 7 cubic foot capacity to handle the comforter, but drying it outside gives it a fresh air smell not attainable even with the best of softener products and sheets. Check the care tag to verify your comforter can be washed at home. Some down comforters require special cleaning to help them keep their shape. Standard fabrics such as polyesters and cotton-poly blends can be washed at home following the instructions on the tag.